Though many areas of the country are attempting to remove fluoride from municipal water supplies, the American Dental Association (ADA), along with powerful government figures continue to poison masses of people without their consent. 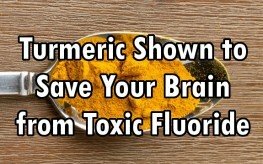 Fortunately, a study published in Pharmacognosy Magazine titled, “Curcumin attenuates neurotoxicity induced by fluoride: An in vivo evidence,” proves that the spice turmeric can prevent and even reverse damage from exposure to toxic fluoride. Sayer Ji, of GreenMedInfo has done an incredible job amalgamating scientific research links on the effects of fluoride on the brain and cognitive health. If you ever want to be truly convinced of just how toxic fluoride is, you should peruse just a few of the studies on his list. Even if small doses of fluoride were acceptable, which they aren’t, considering the fact that Colgate once admitted in 1984 that a single tube of toothpaste with fluoride in it was toxic enough to kill a small child, how can one argue for water fluoridation? Fluoride in our water cannot be regulated for dosage, and has no medical oversight, even though the FDA has scheduled it as a ‘drug.’ So, while toxic water keeps us distracted and sick, we have to take matters into our own hands. One of the easiest ways, aside from never drinking municipal water that hasn’t been filtered really well, is to increase the intake of turmeric. Curcumin does not just exist in turmeric, but it is within the root-like rhizomes that large quantities linger. 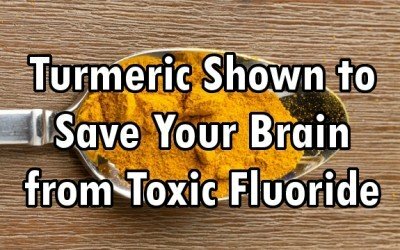 Aside from the fact that turmeric has been proven to kill cancer cells, shrink cancerous tumors, and even inhibit inflammation in the body, it can also protect the neurodegenerative effects of fluoride intake. Curcuma longa is a primary ingredient in turmeric and curry powders which are used as spices in the Middle East, Asia and India. Pure turmeric powder has the highest curcumin concentration, averaging 3.14% by weight. You can find turmeric in all kinds of delicious Indian dishes like lentil soup, Chicken Tikka, Baigan Ka Bharta, various curries, and mango chutney. An Indoensian favorite that is full of curcumins from turmeric is Ayam Goreng Kuning. You can also simply take a turmeric supplement or shave off the roots into your own fresh powder, grating or grinding it with a fine shaver or cheese grater. In addition to utilizing turmeric for protection against fluoride, research has shown that the tulsi plant (holy basil) is actually capable of removing fluoride from water while supporting the pineal gland. What’s more, tamarind can also help detox fluoride from the brain. Lastly, try utilizing these 5 tips for detox fluoride treatment.